By the end of summer, many feel weary and a little “over” landscaping maintenance – especially when wilting plants and faded mulch have replaced the perky, colorful flower beds of spring. The good news is that fall is the perfect time to make plans to reenergize your outdoor living space. And landscaping rocks can play a big part in giving new life to tired beds and boring or troublesome areas. But where do you begin? Landscaping rocks vary in size and color, all of which can compliment your existing plants or lawn features and set a specific mood for your garden. For example, earth-toned beach pebbles can add warmth to a stark corner, while white marble chips can bring light to a shady patch. Black lava rocks or terracotta stones can add a tropical feel, but might look out-of-place next to a Cape Cod-inspired home. Because rock is durable and will last for years to come, it’s important to consider the type and color that will support your current and long-term landscaping vision. 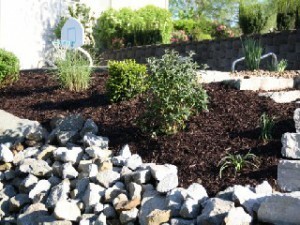 Using rock for groundcover instead of mulch is an alternative for those who want low-maintenance landscaping. Although rocks are more expensive, they are durable and don’t have to be replaced every year. In fact, not only can they provide contrast, texture and dramatic color, they will last the lifetime of your garden. Rocks also discourage weed growth, especially when coupled with a weed barrier. Installing a rock garden – especially near eyesores or awkwardly shaped areas – can bring artistic elements to any outdoor living area. Rock gardens work especially well in sunny spots. Start with two or three medium to large rocks, and layer with smaller rocks or pebbles. Add low-lying flowers or ground cover, filling in gaps and creating an inviting and beautiful attraction. Instead of a rock garden, you can just go with one large boulder and create a dramatic focal point – a natural art sculpture. For optimum effect, choose an uniquely shaped or colored boulder, and use it as a centerpiece much like you would an ornamental shrub. These can be particularly useful along monotonous hedges, borders or fences. Large or medium-sized rocks can enhance water elements and help camouflage pond liners or fountain gear. Remember that natural shapes and sizes (versus pavers) will blend in better with plants and surrounding features, maintaining an organic look and feel. If you have a shady or well-worn area that is challenging for plant or lawn growth, make a path or walkway by using a combination of flat stones and surrounding pebbles. This not only brings color and beauty to an otherwise bland section of your outdoor space, it can also increase accessibility and safety levels on treacherous or uneven ground. Stones, rocks and pavers can create a beautiful, low-maintenance environment and give new life to your property. Whether it’s with small additions or big landscaping overhauls, we can help you transform your end-of-summer blues into an outdoor dream. Give us a call at (317) 259-9222 to find out more.